Home › General Support › can’t upload Zip files? Last modified: April 8, 2019 at 9:00 am by Charles C.
Don’t upload Zip files using the image block in the new Guttenberg post editor in WordPress. If you try to use the image editor, then you’ll see an error message like this. 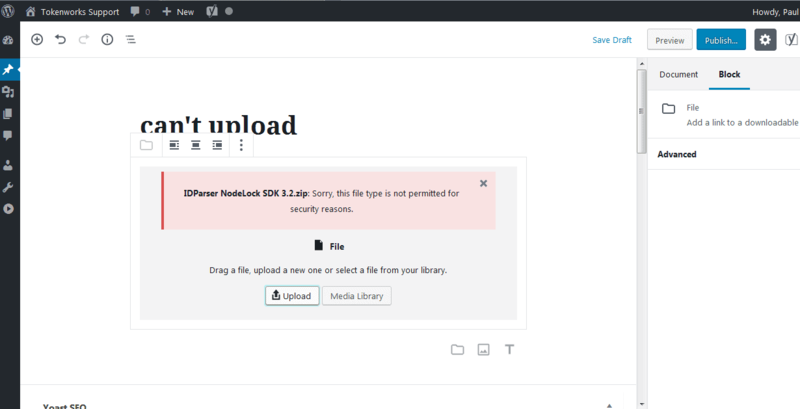 The image shows what happens when you try to upload a file from within the Editor. To upload a zip file, go to the media libary page, and then add you zip files to the media library, and then you can add the zip file to your post from the media library.